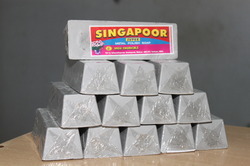 Singapoor Pink Metal Polishing Soap can be used for final polishing in all Aluminium and Stainless steel products. 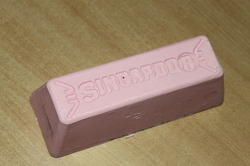 We are providing a range of Singapoor Pink Metal Polishing Soap to our valuable clients. This Singapoor Pink Metal Polishing Soap is provided with the assistance of our highly qualified experts using the latest and advanced technology. 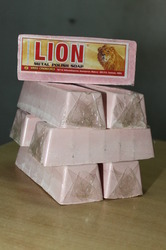 We are a leading Manufacturer & Exporter of Singapoor Pink Metal Polishing Soap. Lion Pink Stainless Steel Polishing Bar can be used for super fine mirror finishing in all Stainless steel products. We have been widely appreciated in the domain of manufacturing and supplying of Lion Pink Stainless Steel Polishing Bar. We are a leading Manufacturer & Exporter of Stainless Steel Polishing Bar. Singapoor Black Buffing Bar Soap can be used for final polishing in all Stainless steel and aluminium products. We bring forth a wide assortment of Singapoor Black Buffing Bar Soap for our esteemed clients. 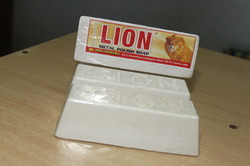 We are a leading Manufacturer & Exporter of Buffing Bar Soap. 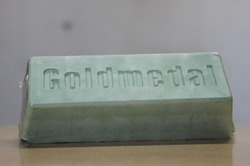 Gold medal Green can be used for final polishing in all Stainless steel products. We are a leading Manufacturer & Exporter of Stainless Steel Buffing Compound . Lion White can be used for mirror finishing in all Aluminium products. We are a leading Manufacturer & Exporter of Aluminium Polishing Compound. We are presenting a wide gamut of Metal Polishing Products, which is manufactured from superior quality raw material. Our this array is developed using all the high-tech machines and tools, ensuring their long working life. This range enlists Green Bars, Grey Bars, Black, White Bars, Tripoli compound, and Metal Polishing Compound. Following this recognized policy, we provide flawless products and services to our clients. The finished products are quality tested on various parameters which includes buffing, polishing and many others. Our efforts are not only limited in quality only, but also ensure that the products are delivered on time at the client's specified destinations. Further, we strive to improve of product line with the passage of time. Our ethical business practices and client centric approach have accelerated the growth of the organization. We are proficiently catering to the requirements of various countries across the globe, such as Africa, Europe and Asia.